Have you ever thought about the history of the humble pocket? 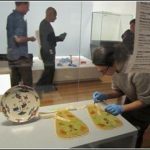 This past winter, Keira Miller, an intern from the University of Glasgow’s Center for Textile Conservation, helped us with the treatment of some detachable 18th century pockets for the exhibition European Splendour 1500-1800. 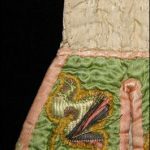 Keira writes about the importance of pockets in 18th century fashion and the techniques she used to conserve a pair. What do you carry in your pockets? Phone, keys, wallet, money – or maybe something more personal? When my brother and I were young, my grandmother often used to tell us that little boys should always carry a ball of string in their pockets. I never really understood this claim – why did boys need string but girls didn’t? As a grown woman I am always thrilled if I find a new dress or pair of trousers with good deep pockets, and often wonder to myself why it is that pockets in men’s garments always seem to be so much bigger. Pockets, circa 1760, England, maker unknown. Gift of the Wellington Embroiderer’s Guild Inc., 2002. CC BY-NC-ND licence. Te Papa (GH007784). Ribbons not original. From the 17th century through to the 19th century, most European women and girls, no matter their social standing, would have owned at least one pair of detachable pockets. These examples from Te Papa’s collection are made from various silk fabrics, including appliqué flowers worked in a silk brocade with silver thread. Evidence suggests that scraps have been used for the reverse and the linings, as the fabrics have been pieced together from smaller bits. Decorative embroidery techniques used to embellish them include crewel work, quilting and appliqué. For an 18th century woman, who may have had very had little in the way of privacy or ownership, pockets may well have been the place where some of her most prized possessions were kept safe and close at hand. My favourite feature of the pockets – which one can only discover by peering inside or viewing the tell-tale stitching on the reverse – is a cleverly made inner pocket, much like those sewn into modern handbags. I find myself wondering what particularly special things the wearer of these pockets chose to keep so close to her person. Might it possibly have been a ball of string? Pockets, circa 1760, England, maker unknown. Gift of the Wellington Embroiderer’s Guild Inc., 2002. CC BY-NC-ND licence. Te Papa (GH007784). Ribbon at right is not contemporary with the pocket. Pockets were worn beneath a woman’s outer garments, with cord or ribbon tied around the waist of the wearer and the pockets hanging safely between her under and her outer garments. This intimate positioning led to pockets being widely commented on by diarists, satirists, and novelists alike. In order to allow access to pockets, the side seams of dresses and petticoats made during this period would have an opening though which the hands could be inserted. All of the dresses in the display European Splendour 1500-1800, have openings to allow for access to pockets. If you are planning a trip to view the exhibition, see if you can spot these when you see the gowns! Despite their close proximity to the body, many pockets (and their contents), were lost or stolen, and you can read more about such thefts, and the interesting things people kept in their pockets on the V&A’s website in an article called ‘A history of pockets’. The British nursery rhyme Lucy Locket (sung to the tune of Yankee Doodle), makes reference to lost pockets too – although it is also thought to have one or two double meanings thrown in for good measure! Some pockets would have been professionally made, and perhaps even made to match outer garments such as petticoats or jackets. However, most pockets would have been home-made using scraps left over from either dress fabrics, household linens or furnishing fabrics. Paper patterns with embroidery designs to follow were widely available in the 18th century and many women and young girls would have seen embellishing their pockets as a way of a way of personalising an intimate item of their clothing. It is also thought that making pockets would act as domestic needlework practice for young girls. 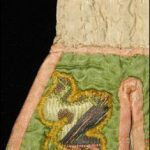 When the pockets were assessed to determine what would be needed to display them, it was apparent that some of the metal threads in the brocade appliqué had come loose and were in danger of becoming detached entirely. I elected to use a stitching technique known as couching to secure the metal threads in place. This involved applying short horizontal stitches over each of the individual loose threads. A protective overlay of nylon netting was applied over damaged sections of the pink ribbon binding. I used a very fine ‘hairsilk’ thread for the stitching, dyed to the correct matching shade prior to the stitching being carried out. 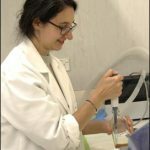 Intern Keira Miller in the lab, preparing materials for dyeing. Photo by A. Peranteau, copyright Te Papa. Pockets, circa 1760, England, maker unknown. Gift of the Wellington Embroiderer’s Guild Inc., 2002. Te Papa GH007784. Detail of metal threads after conservation treatment. Photo by K. Miller, copyright Te Papa. Textile conservation intern Keira Miller making the final adjustments on the display of pockets prior to the exhibition opening. Photo by A. Peranteau, copyright Te Papa. Pockets, circa 1760, England, maker unknown. Gift of the Wellington Embroiderer’s Guild Inc., 2002. CC BY-NC-ND licence. Te Papa (GH007784). Detail of lifting metal threads before conservation treatment. For display, we also dyed a replacement ‘ribbon’ of ivory silk and threaded it through the top horizontal openings of the pockets to better suggest to the viewer how these pockets would have been worn. Come and see these and other works on display and join the curators for a special Splendour Evening floortalk event 16 Feb 2017, 6.30pm. Loved getting to know about this curious, fun information! This is fascinating. The pocket shown, with it’s delicate pink satin slit opening is so very female in it’s design, I can’t help thinking of parallels with keeping oneself / one’s treasures safe, especially from men. A very interesting article, thank you.